Our Pink Roses Basket Arrangement is the perfect way to convey your direct sentiments. This arrangement of All Pink Roses will surely be the center of attraction and is suitable for all celebrations. Call us today, (516) 248-8544 or order online 24/7 Vogue Flowers in Williston Park, NY and we'll be glad to assist you. Note this item can be customized and upgraded to $299.95. Item code VFPRWB31. 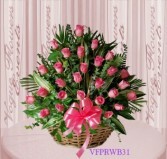 VFCDP-1; Vogue's Classic Dozen Pink Roses artfully arranged in a clear vase with a matching ribbon. Suitable for any occasions. 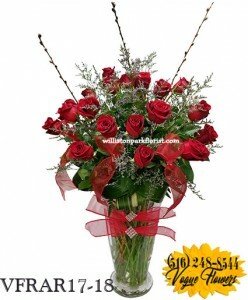 This arrangement can be upgraded to 18 Stems of Pink Roses 122.95; 24 Stems of Pink Roses 159.95. Call us today (516) 248-8544 or order online 24/7 Vogue Flowers in Williston Park, NY and we'll be glad to assist you.